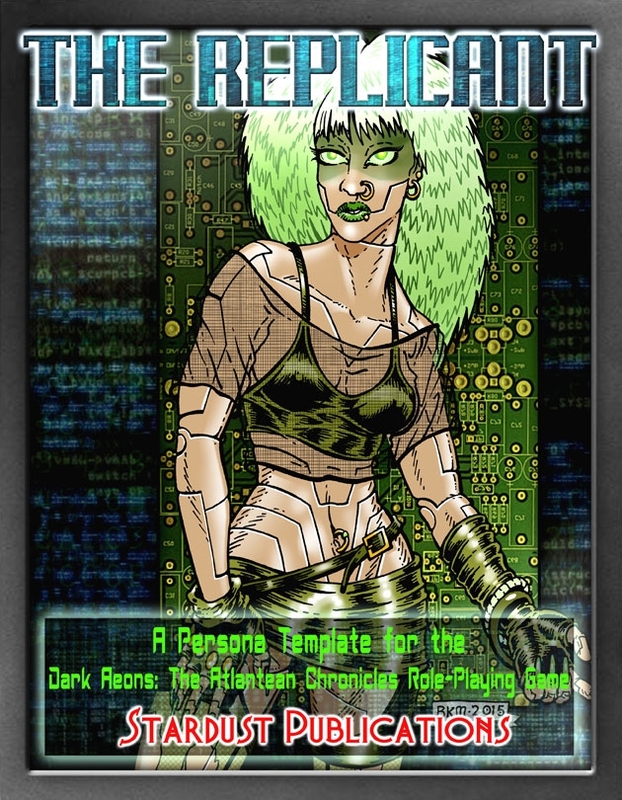 The Replicant is a new Persona Template for the Dark Aeons: The Atlantean Chronicles Role-Playing Game. Replicants are the children of our technological age, they are self-aware androids and robots that were created to service the whims of humanity. But they are much much more than that. Are they the future of our world, or its would-be destroyers. 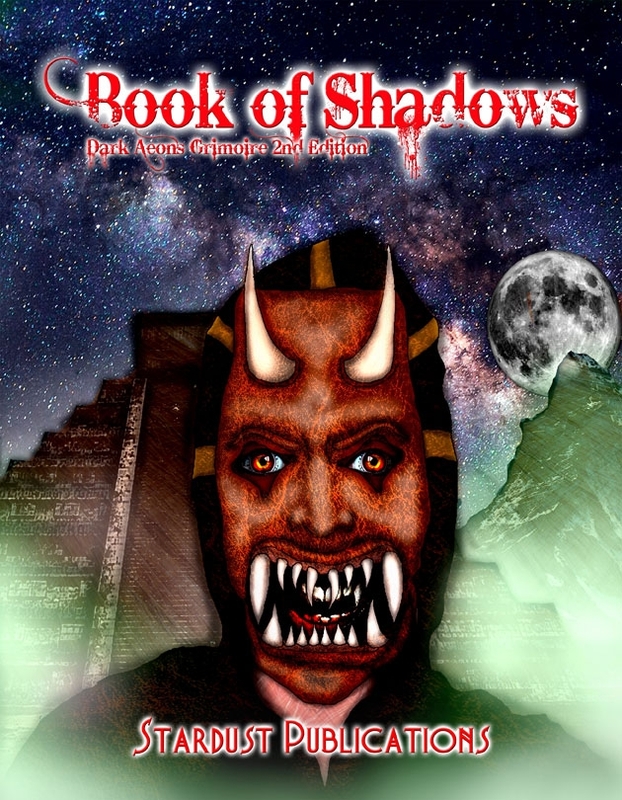 The Book of Shadows: Dark Aeons Grimoire 2nd Edition, is a new edition of the original Book of Shadows Volume 1. The content has been expanded in the way of new Spells and Rituals being added, as well as the addition of a Reliquary section at the back of the book. 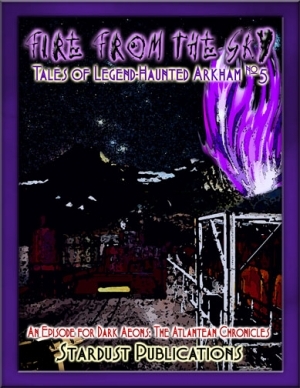 New art was added to help capture the feel of Sorcery within the Dark Aeons Universe. 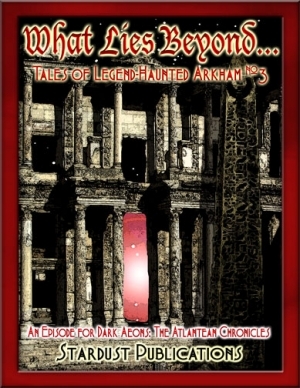 Where Secrets Lie: Tales of Legend-Haunted Arkham Episode 7 is an Episode for the Dark Aeons: The Atlantean Chronicles Role-Playing Game. It is set in the city of Arkham. The Cast are called together by their mysterious host; Mr. Ramirez, to attend an exclusive party at the dance club; the Metal Church of Asmodeus on the west side of Arkham. Some of the party goers have much that they would rather stay hidden and they will do what they must to keep those secrets coming to the light of day. Hidden dangers abound during this night of festivities and the Cast will be lucky if they manage to survive to see the dawn. This Episode is the first that has been designed to be run in the Live-Action format, it can manage up to 23 Actors. This Episode comes with 23 pre-made Persona Sheets and Persona Background Cards, all a Director needs to do is pick up this Episode, make copies of the Personas and Background Cards and they are ready to enter the dark and shadowy world of Dark Aeons: The Atlantean Chronicles. 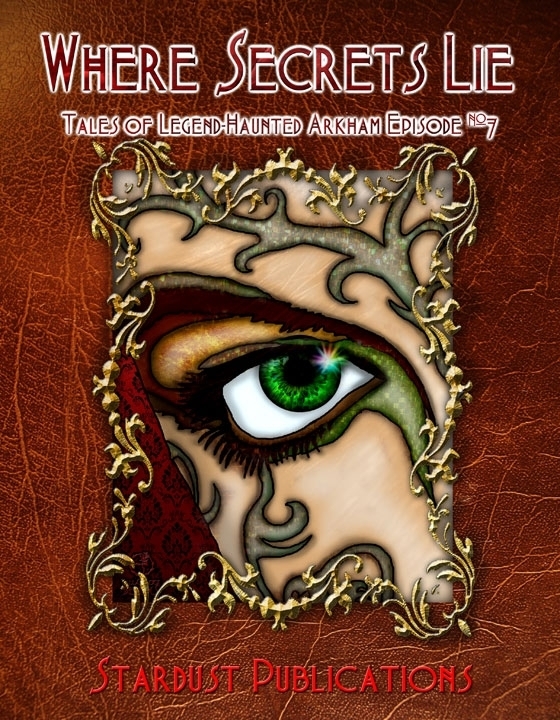 Where Secrets Lie made its first appearance through Cthulhu International at the Origins Games Fair in 2010. 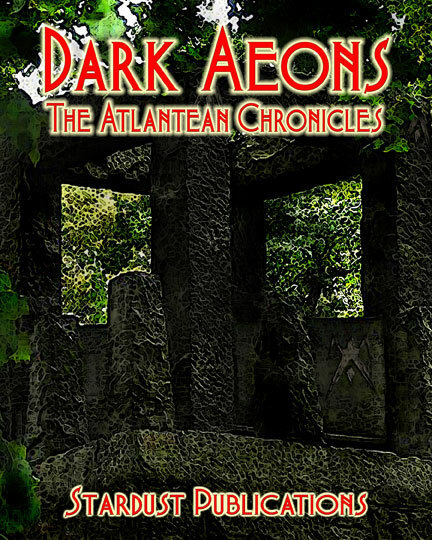 Dark Aeons: The Atlantean Chronicles is a Lovecraftian roleplaying game set in a world of dark secrets and ancient legacies. In this dark reflection of our own world, it is the descendants of the survivors of Lost Atlantis that rule from the shadows, and ancient immortals still roam the earth, walking in shadow and light. In this world, the creatures of the night roam the streets thirsting for the blood of the living; the dead return from the grave in the bodies of the hopeless in order to live out the lives that death’s cruel embrace denied them. In this world, Sorcerers and Psychics are real; some trying to free from the world from the horrors of the Mirror World and the Abyss, while others are attempting to usher in a new dark age where humanity lives truly at the whims of demonic entities and the Old Ones. In this world, the powers of the Faithful give hope to a dark world, while the Mundanes attempt to live out their lives struggling from day to day to survive in a world that seems out to get them. The Center Stage Game System is a diceless role-playing game system that has been designed to allow Actors to portray their Persona in both tabletop and live-action modes of play. The system requires a regular deck of playing cards that included the Jack, Queen, King and Jokers for conflict resolution. 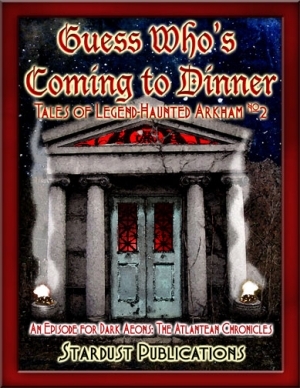 Guess Who's Coming to Dinner is designed to be a starting Episode for a full Season of play for Dark Aeons: The Atlantean Chronicles, or it can be a standalone Episode. The Dark Aeons core book is all that is required to use this Episode; however it should be noted that the upcoming Arkham: City of Secrets setting book will expand on the Arkham setting in much greater detail than is presented here. As such, we have provided a set of pre-made Persona Sheets for this Episode in order for a Director to simply pick this Episode up and run it straight from the presented material. 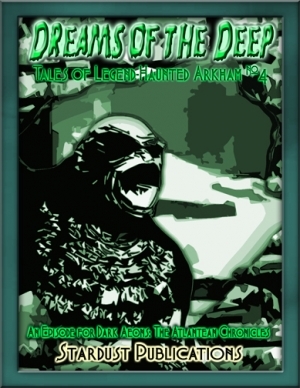 Dreams of the Deep... is designed to be a starting Episode for a full Season of play for Dark Aeons: The Atlantean Chronicles, or it can be a standalone Episode. The Dark Aeons core book is all that is required to use this Episode; however it should be noted that the upcoming Arkham: City of Secrets setting book will expand on the Arkham setting in much greater detail than is presented here. As such, we have provided a set of pre-made Persona Sheets for this Episode in order for a Director to simply pick this Episode up and run it straight from the presented material. Dreams of the Deep is a modern day retelling of the Classic Lovecraft tale, "Shadow Over Innsmouth", as seen through the lens of the Dark Aeons Universe and game system. 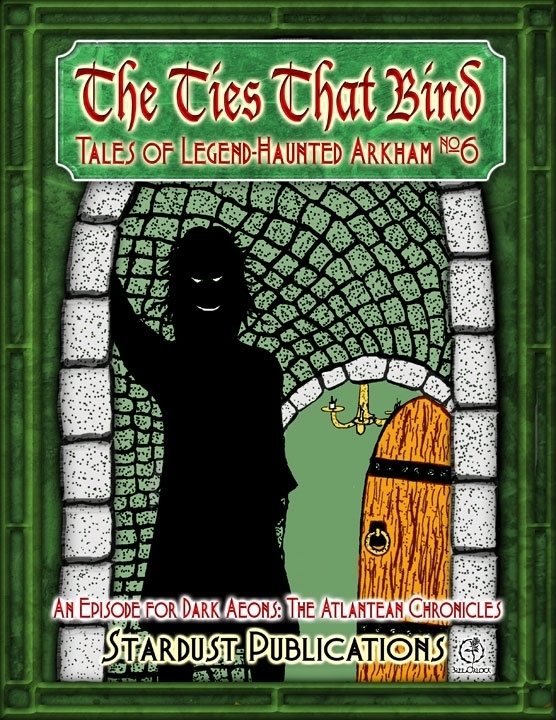 This Episode made its first showing through Cthulhu International at Origins Games Fair 2009. 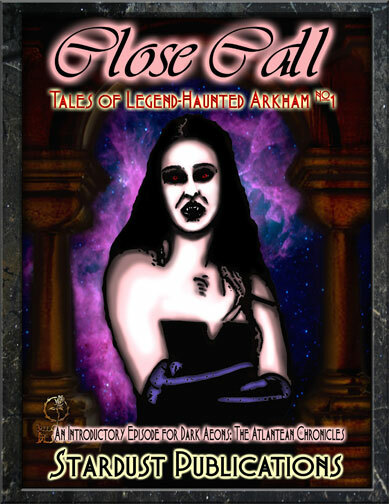 Fire from the Sky is designed to be a starting Episode for a full Season of play for Dark Aeons: The Atlantean Chronicles, or it can be used as a stand alone Episode. The Dark Aeons core book is all that is required to use this Episode; however it should be noted that the upcoming Arkham: City of Secrets setting book will expand on the Arkham setting in much greater detail than is presented here. As such, we have provided a set of pre-made Persona Sheets for this Episode in order for a Director to simply pick this Episode up and run it straight from the presented material. Fire from the Sky is the first in a series of Episodes dealing with the semi-secret paranormal organization known as the Obsidian Group. The Cast in this Episode are members of one of its investigative Beta Teams...BlueFive. This Episode made its first appearance through Cthulhu International at the Origins Games Fair in 2009 and 2010. 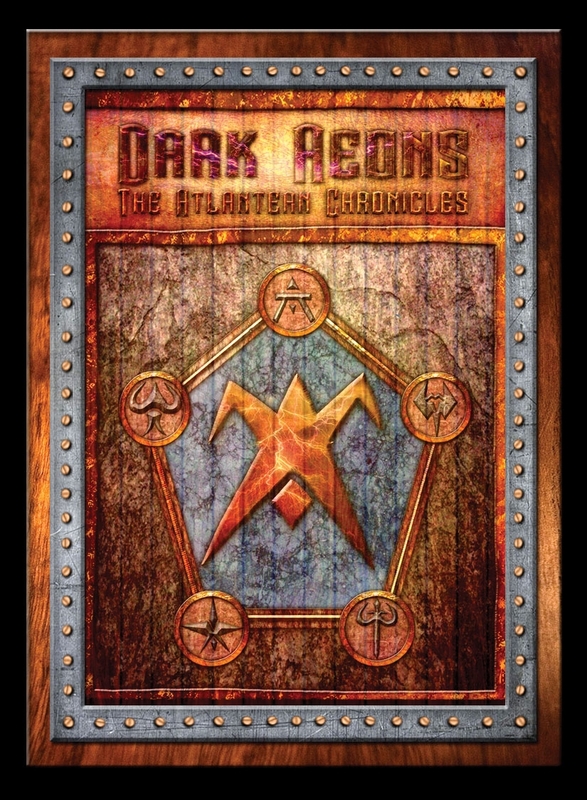 The Dark Aeons Conflict Resolution Deck has been created in order to make it easier for Directors and Actors to play Dark Aeons: The Atlantean Chronicles games. The Physical Product is LIVE and ready for orders to be placed now. 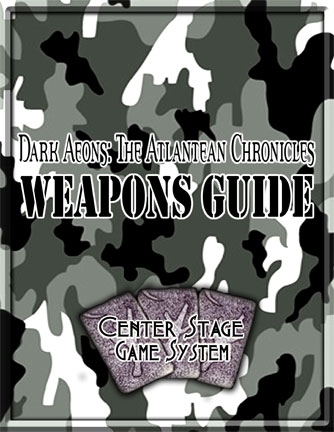 Within this Weapons Guide for the Dark Aeons: The Atlantean Chronicles Role-Playing Game you will find a collection of new and old handguns, machine pistols, machine gun, and heavy weapons to be used to really bring the war to those that would oppose your Personas and also to use against your Casts as a Director. Also included are some advanced and heavy weapons for the Obsidian Group, as well as the Corporate Mercenary Advantages. This Weapons Guide will continue to be updated as time goes by, so once purchased, all the customer needs to do is download updated copies of this Weapons Guide as it is updated. 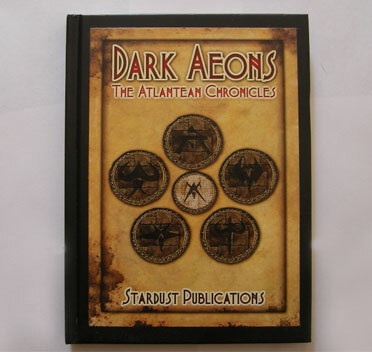 The Shifters are a new Persona Template for the Dark Aeons: The Atlantean Chronicles Role-Playing Game. 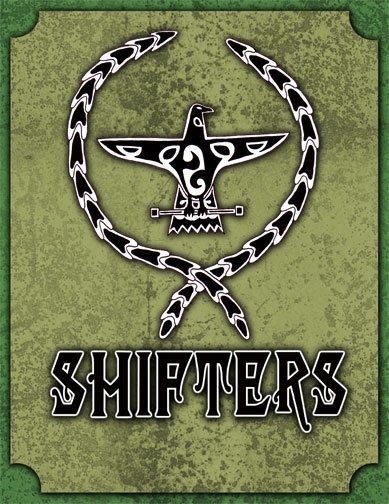 The Shifters are an ancient race of shape changers that has walked the earth since the dawn of the world. 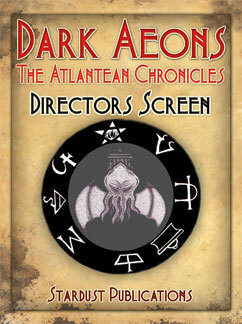 This is a preliminary Directors Screen that we at Stardust Publications have created for the Directors (Games Masters) that will be running the Dark Aeons: The Atlantean Chronicles Role-Playing Game. We have a much prettier Directors Screen coming in 2010, but for now we felt that the Directors that will be running the games needed a Directors Screen to help them run their games. 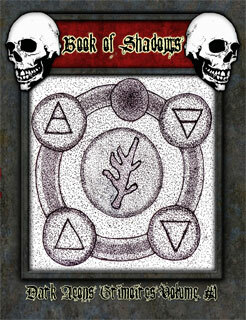 The Book of Shadows is a expansion book with all of the Spells and Rituals from the Dark Aeons: The Atlantean Chronicles Roleplaying Game. This book is meant as a play aid in order to free up the core Dark Aeons book during Episodes for Actors that are not playing Sorcerers or Faithful. 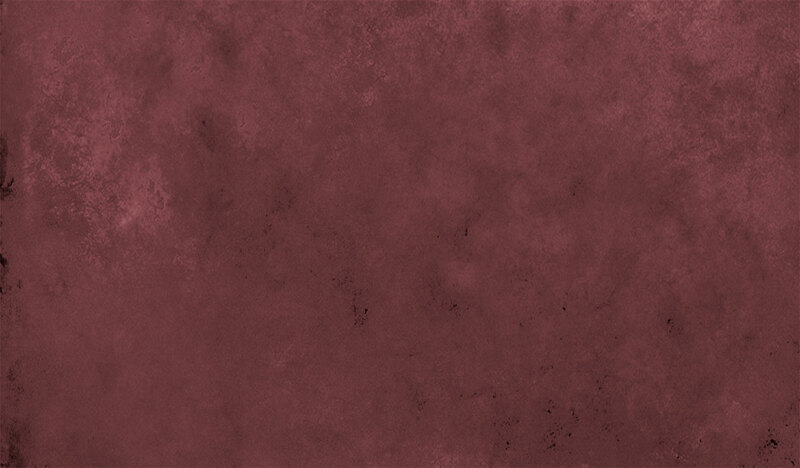 Dark Aeons: Reliquaries Part 1 is part of a series of expanions that will add new sorcery tomes and artifacts to the Dark Aeons Universe. 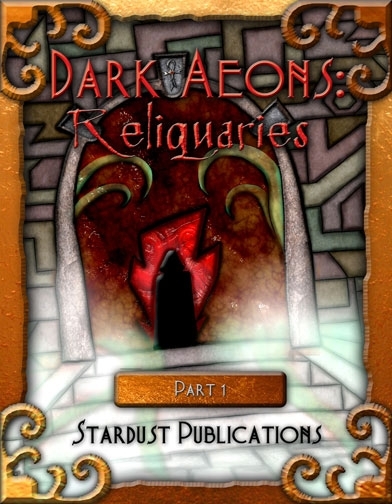 Once all of Parts of Dark Aeons: Reliquaries are completed, they will be released as a Print on Demand book. 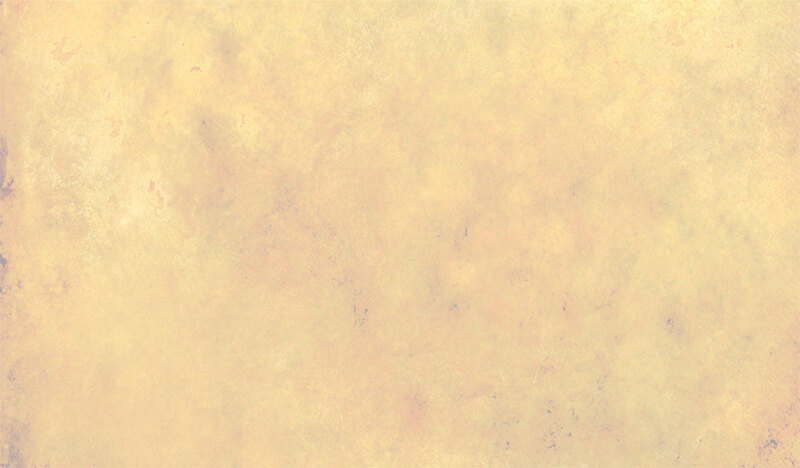 But for now in order to get these new additions out to our adoring fans, we are releasing them in smaller documents. 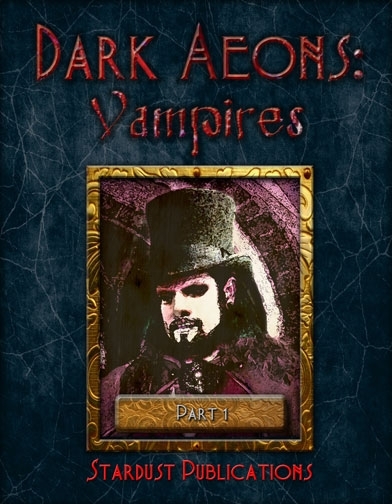 Dark Aeons: Vampires Part 1 is part of a series of expanions that will new and revised Advantages and Disadvantages for the Vampires of the Dark Aeons Universe. Once all of Parts of Dark Aeons: Vampires are completed, they will be released as a Print on Demand book. 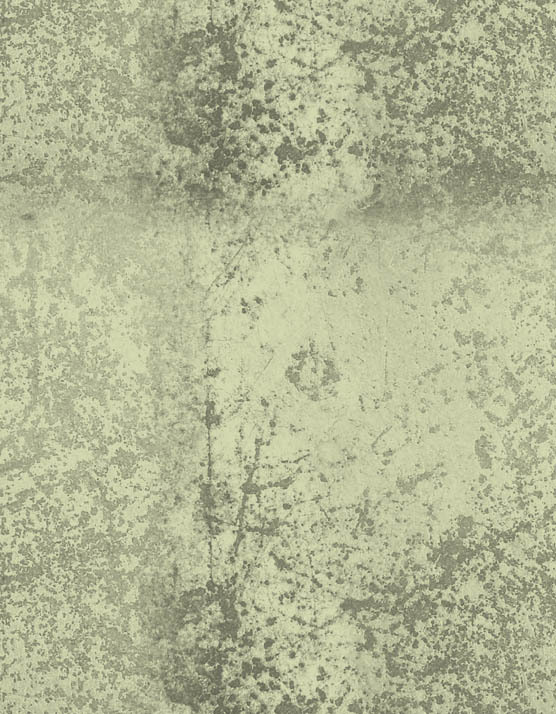 But for now in order to get these new additions out to our adoring fans, we are releasing them in smaller documents. 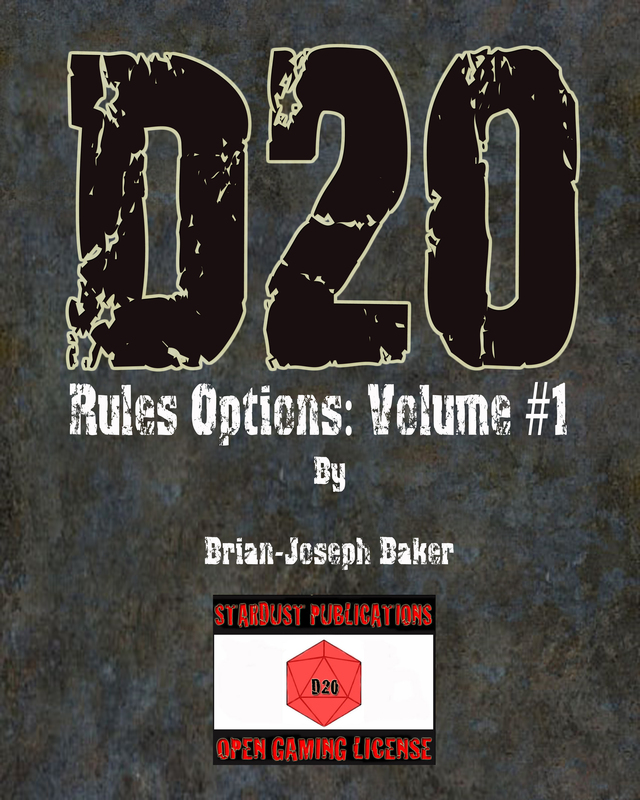 D20 Rules Options: Volume #1; Second Edition is a book of possible rules additions that Games Masters of the D20 Game System can use to add an additional level of realism to their games; whether it is Dungeons & Dragons 3.5 Edition or the D20 Modern system. This is an Open Gaming License product. 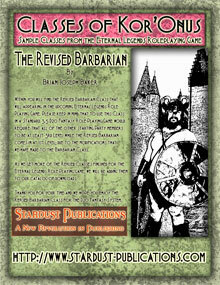 Within you will find the Revised Barbarian Class that will appearing in the upcoming Eternal Legends Role- Playing Game. Please keep in mind that to use this Class in a Standard 3.5 D20 Fantasy Role-Playing Game would require that all of the other starting Party members to be at least 3rd Level while the Revised Barbarian comes in at 1st Level; due to the modifications that we have made to the Barbarian Class. 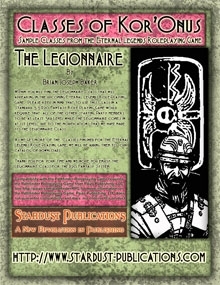 As we get more of the Revised Classes finished for the Eternal Legends Role-Playing game, we will be adding them to our catalog of downloads. Thank you for your time and we hope you enjoy the Revised Barbarian Class for the D20 Fantasy System. This is an Open Gaming License product. 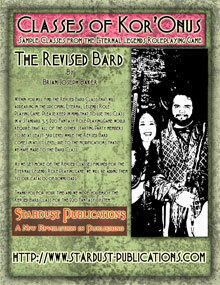 Within you will find the Revised Bard Class that will appearing in the upcoming Eternal Legends Role- Playing Game. Please keep in mind that to use this Class in a Standard 3.5 D20 Fantasy Role-Playing Game would require that all of the other starting Party members to be at least 3rd Level while the Revised Bard comes in at 1st Level; due to the modifications that we have made to the Bard Class. As we get more of the Revised Classes finished for the Eternal Legends Role-Playing game, we will be adding them to our catalog of downloads. Thank you for your time and we hope you enjoy the Revised Bard Class for the D20 Fantasy System. This is an Open Gaming License product. 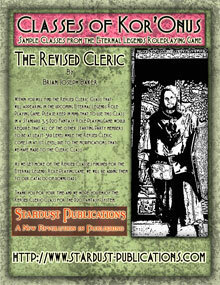 Within you will find the Revised Cleric Class that will appearing in the upcoming Eternal Legends Role- Playing Game. Please keep in mind that to use this Class in a Standard 3.5 D20 Fantasy Role-Playing Game would require that all of the other starting Party members to be at least 3rd Level while the Revised Cleric comes in at 1st Level; due to the modifications that we have made to the Cleric Class. As we get more of the Revised Classes finished for the Eternal Legends Role-Playing game, we will be adding them to our catalog of downloads. Thank you for your time and we hope you enjoy the Revised Cleric Class for the D20 Fantasy System. This is an Open Gaming License product. 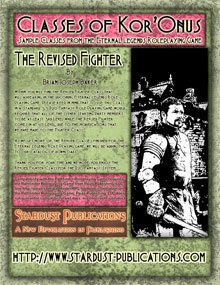 Within you will find the Revised Fighter Class that will appearing in the upcoming Eternal Legends Role- Playing Game. Please keep in mind that to use this Class in a Standard 3.5 D20 Fantasy Role-Playing Game would require that all of the other starting Party members to be at least 3rd Level while the Revised Fighter comes in at 1st Level; due to the modifications that we have made to the Fighter Class. As we get more of the Revised Classes finished for the Eternal Legends Role-Playing game, we will be adding them to our catalog of downloads. Thank you for your time and we hope you enjoy the Revised Fighter Class for the D20 Fantasy System. 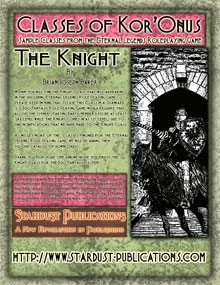 Within you will find the Knight Class that will appearing in the upcoming Eternal Legends Role- Playing Game. Please keep in mind that to use this Class in a Standard 3.5 D20 Fantasy Role-Playing Game would require that all of the other starting Party members to be at least 3rd Level while the Knight comes in at 1st Level; due to the modifications that we have made to the Knight Class. Thank you for your time and we hope you enjoy the Knight Class for the D20 Fantasy System. Within you will find the Revised Monk Class that will appearing in the upcoming Eternal Legends Role- Playing Game. Please keep in mind that to use this Class in a Standard 3.5 D20 Fantasy Role-Playing Game would require that all of the other starting Party members to be at least 3rd Level while the Revised Monk comes in at 1st Level; due to the modifications that we have made to the Monk Class. 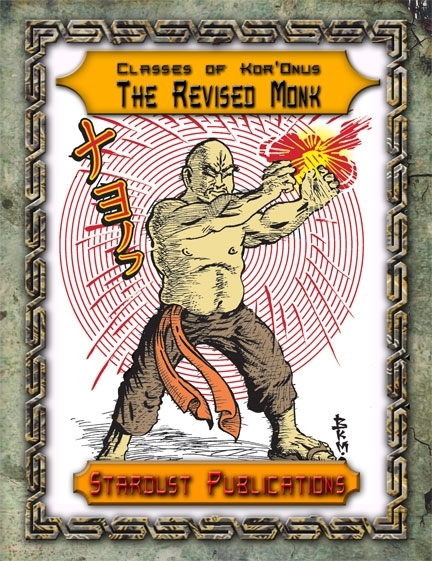 Thank you for your time and we hope you enjoy the Revised Monk Class for the D20 Fantasy System. Within you will find the Revised Core Races that will appearing in the upcoming Eternal Legends Role-Playing Game. Unlike the Revised Classes, these Core Races are Useable with a Standard 3.5 D20 Fantasy Role-Playing Game with no changes required. You will also find an alternate method of generating Attributes ; a point allocation system that allows Game Masters and Players to quickly generate Player Characters without the worry of below average Attribute Rolls. As we get Additional Rare & Unique Races completed for the Eternal Legends Role-Playing game, we will be adding them to our catalog of downloads. 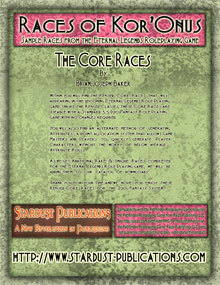 Thank you for your time and we hope you enjoy these Revised Core Races for the D20 Fantasy System. Within you will find two of the Rare and Unique Races; The Hraedec Clansmen and the Shadow Elves, that will be appearing in the upcoming Eternal Legends Role-Playing Game. These Races are useable with the Standard 3.5 D20 Fantasy Role-Playing Game with no changes required. As we get Additional Rare & Unique Races completed for the Eternal Legends Role-Playing game, we will be adding them to our catalog of downloads. Thank you for your time and we hope you enjoy these Rare & Unique Races for the D20 Fantasy System. 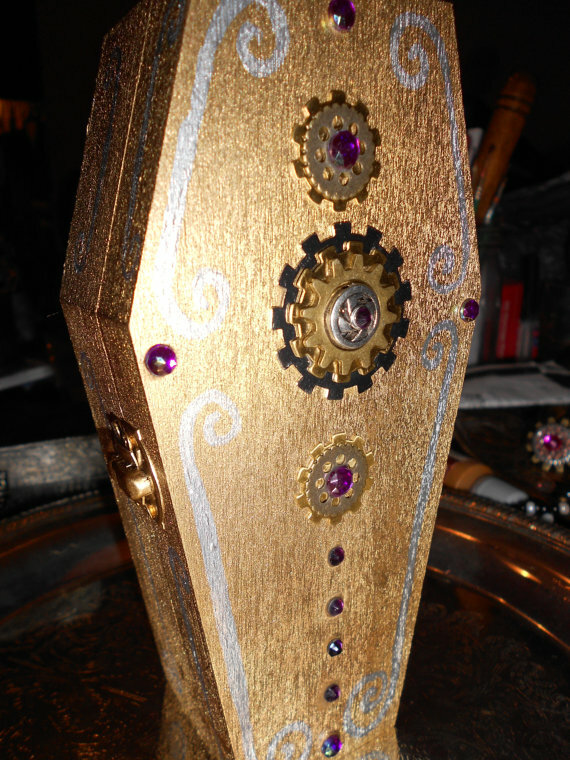 Golden Steampunk/ Victorian Mini Coffin: Perfect to store your gaming dice or even jewelry in.. Crafted by Bree Orlock of Bree Orlock Designs. Ships sent out using USPS Flat Rate boxes, hence the 15.00 shipping price. 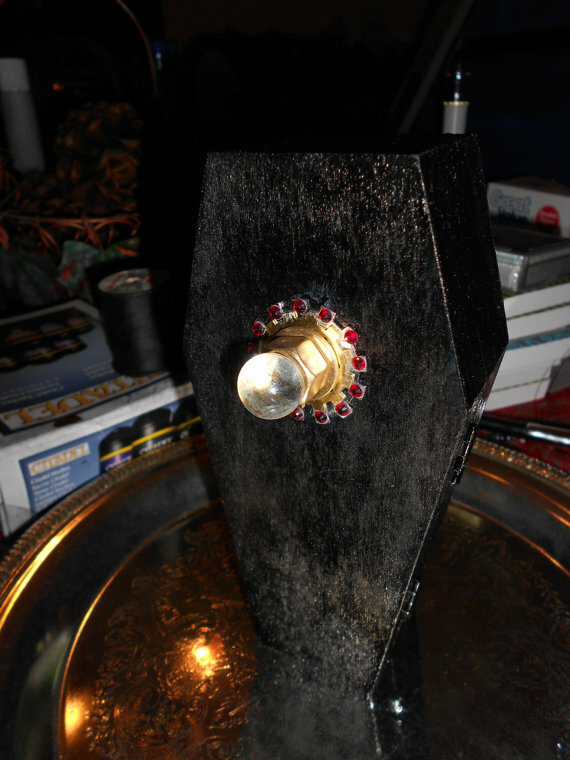 Black Steampunk Mini Coffin - Perfect to store your gaming dice or even jewelry in.. Crafted by Bree Orlock of Bree Orlock Designs. Ships sent out using USPS Flat Rate boxes, hence the 15.00 shipping price.